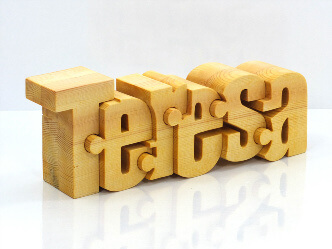 Our hand-crafted single name puzzles are the perfect personalized gifts for any occasion and décor. 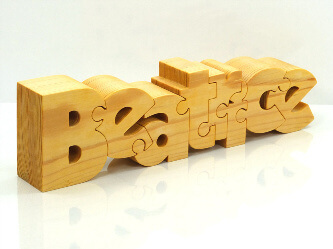 Each puzzle is designed individually and mastered in a way to be joined with the following letter forming a one of a kind personalized artwork. 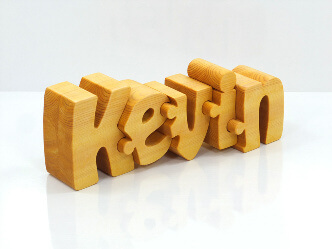 These high quality personalized name puzzles have natural wood colors and patterns, making them a great gift for someone special. They are made from one piece of natural pine wood. The personalized single name puzzles are finished and smoothly sanded to give them a unique feel when you touch them. 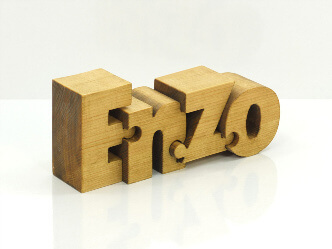 In the final stages of creation, the personalized name puzzles are sealed with olive oil or non-toxic finish to showcase an overall elegant design for every home or office. No two name puzzles are the same! The separate letter seems to be magically suspended in mid-air, but it is actually held in place. It is a real conversation piece and an excellent addition to any horizontal surface. It’s a perfect gift for newborns, kids, family members, relatives, colleagues and friends. This is a gift that will be treasured forever! NOTE: We do not have ready to buy single name puzzles. We make them only by order. Dimensions: 18 x 7 x 4 cm. Dimensions: 16 x 7 x 4 cm. Dimensions: 25 x 7 x 4 cm. Dimensions: 19 x 7 x 4 cm.